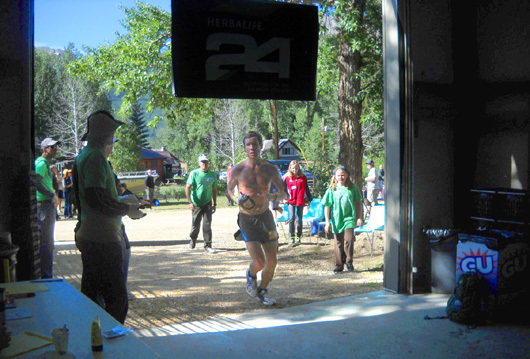 "You ain't nobody until you've DNF'd at Leadville." 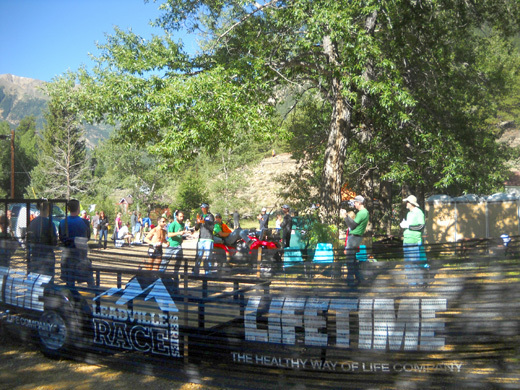 The Leadville 100-mile foot race definitely has a way of leveling the playing field. Fog covers the valley east of Mt. Massive as we drive out to Twin Lakes on Saturday morning. Beautiful blue sky over Mt. 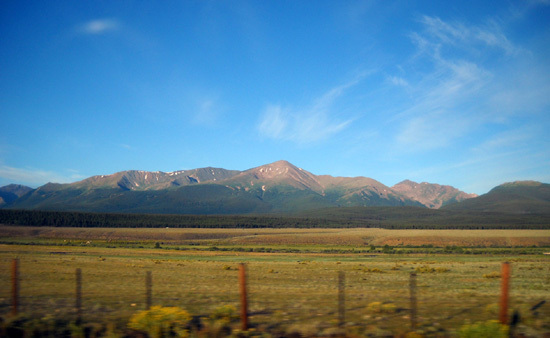 Elbert; this is a view from US 24 as we're driving south to CO 82. Runners use dirt roads and trails on this side of the mountain between Fish Hatchery and Twin Lakes. Jim and I were up at 6 AM yesterday morning so we could get ready for our communications job at Twin Lakes for the LT100 run. We could hear the runners making the nearby turn from 6th Street to McWethy toward the Boulevard but we were too busy to go out to watch them. Temps were in the mid-40s at the start of the race and it was mostly sunny � much improved over the cold, rainy weather last night. It got into the mid- to upper 70s at Twin Lakes during the day. 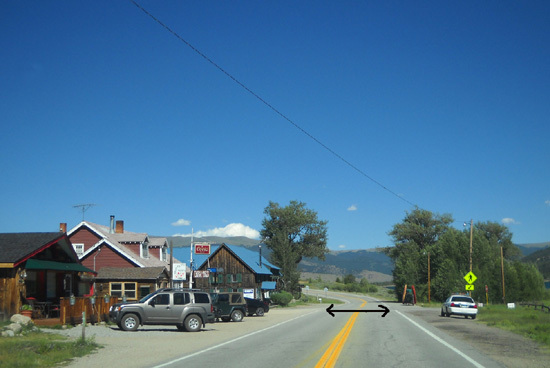 The town sits at about 9,200 feet elevation, a thousand feet lower than Leadville. Although it was cooler at higher elevations the weather was near-perfect on Saturday morning and afternoon for the runners, perhaps a little too warm for some. 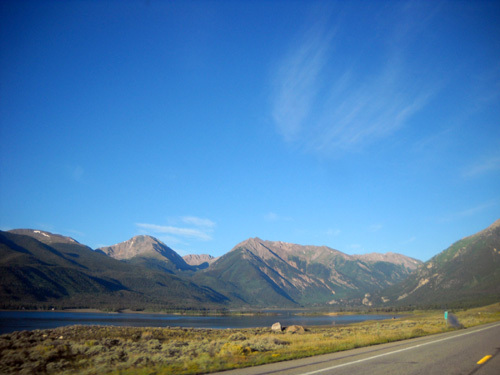 Driving west on CO 82 toward the town of Twin Lakes; the lakes are on the left. There was no rain where we were but some of the runners got into rain/lightning on Hope Pass, marked with an arrow below. That often happens during the race. Runners should just expect crummy weather going one way or the other over the pass so they'll be mentally and physically prepared for it. I never did get out to see Lake Creek where the runners cross, just upstream a couple miles. It was high when we got here about three weeks ago but apparently wasn�t an issue during the race. The runners I asked said it was about the same as usual, although there was a rope this year. We had a looooong day at the Twin Lakes aid station, similar to last year. We got there at 7:30 AM yesterday morning and left just before 2 AM this morning when the sweeps got to both our aid station from Hope Pass and another set of runners swept from Twin Lakes to the next station at Half Pipe. That was a 19� hour shift � whew! 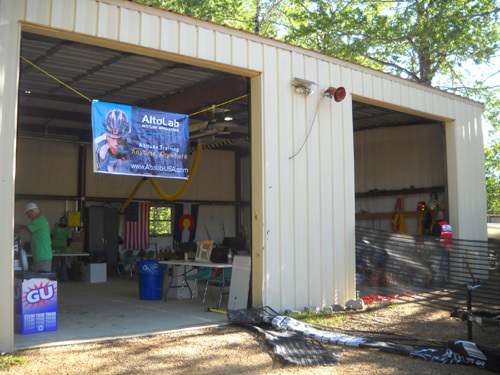 There weren't enough communications/ham radio volunteers to send us any relief. 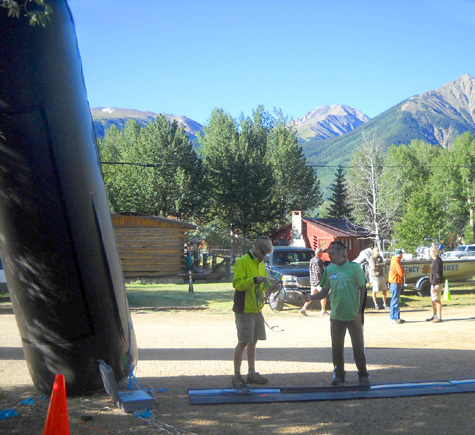 Volunteers set up the inflatable arch in front of the building used for the aid station. We've got a front-row seat! Heather and Jim talk after our truck is in place. When we got to the aid station (AS) in the morning Heather, the station captain, suggested we park right next to the building, not on the other side of a big tree like we did last year. It definitely was more convenient for running number sheets back and forth, and we had a better view of what was going on in the AS. The downside was being pretty much stuck in place and not being able to leave if there had been a replacement "comm" team available (there wasn�t). The crews were much more cooperative and considerate during the run at Twin Lakes, however, than the crews I observed during the bike race last weekend down at the dam. It helped a lot that there weren't as many people involved in the run. In addition, most crews leave after their runners go through Twin Lakes at 40 miles so they can crew at Winfield, then return to Twin Lakes 2 at 60 miles if their runners are still in the race (many drop out before 60 miles). Another factor may be maturity; I would guess that the average age of the ultra runners is older than the entrants in the bike race. 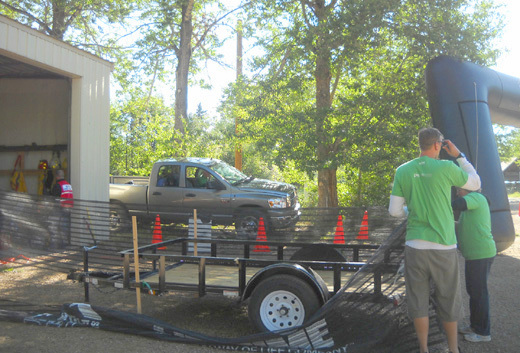 Soon after we got our truck in place I allowed myself to get too frustrated with what I perceived to be a lack of organization at this aid station. My bad. Things were moving so slowly in the morning that I was fearful crews would overwhelm us and runners would be coming in before the netting directing runners into/out of the AS were up, the timing mats were done, etc. 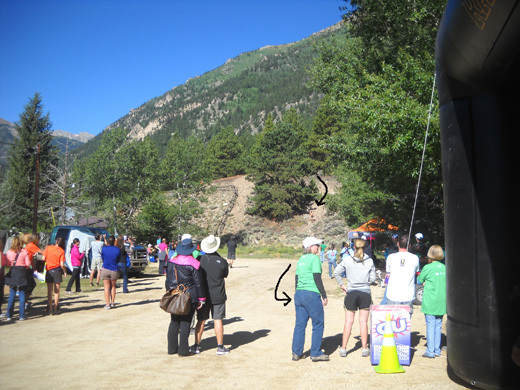 I put out cones to keep vehicles out of the immediate area and I helped do crowd control near the entrance/exit from the aid station (where our truck was parked) until I was too busy with runner times to do that. The arch is in place. Now we're waiting for the runners and their crews to arrive. 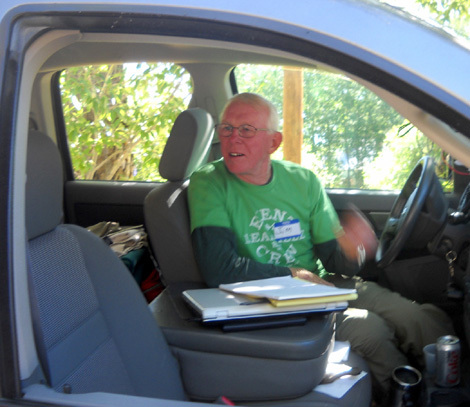 Jim kept telling me to chill out; organizing the aid station was not my job. It�s just so hard sometimes to see things that I think would make a difference and not be able to control them! In this regard Jim's more Type B than I am. In that picture, very few crew members have arrived yet. 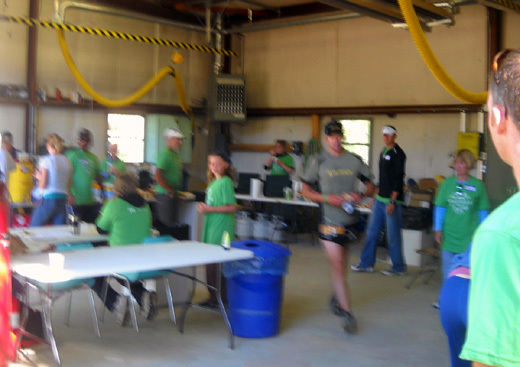 By 40 miles the runners are strung out for several hours so most of the crews were still back at the last aid station. The timing chips were embedded in the runners� numbers this year. I assume our mat was working correctly because I could hear beeps every time a runner went over the mat. The mats at Winfield AS seemed to be collecting data OK but there wasn�t an adequate internet signal in that canyon for the information to be sent to HQ (net control). That was one reason "real-time" results didn't work well during the race. Heather and some other volunteers in our AS kept track of each incoming runner outbound and inbound on sheets of paper, each with room for 27 runner numbers. This was a back-up system to check against the chip times and to use in case the chip system failed. When they filled a sheet a volunteer brought it out to Jim and me or I'd go in an get them. When the runners were few and far between in the evening I'd go in and get partial sheets so we'd have a better idea how many runners were still out there. All runner numbers were listed in order as they came in. Their times were recorded by hand only periodically. Jim entered them into a spreadsheet on his laptop. He did not have to call them in over the radio like he did last year -- a welcome improvement to his use of time. Jim came up with the spreadsheet idea. It really helped us when crews wanted to find out if their runner had come in or dropped out. It was much easier to locate a number that way than on the hand-written sheets from the aid station. Jim sent the outbound and inbound spreadsheets to communications director Bruce Talley at net control. Bruce and the ham radio operators receiving data there were quite busy throughout the race. is probably asking him how he can assist him in the aid station. Because of wilderness logistics Hope Pass and Winfield called their runner numbers in by ham radio. The only numbers Jim called in were drops from our aid station. He also kept track on his computer of drops at the stations before and after ours to help when crews asked about their runners. There was too much radio traffic to HQ to do more than a few �inquiries� about the location of runners. As always, it�s interesting to hear some of what goes on out there � injuries, lost runners, etc. 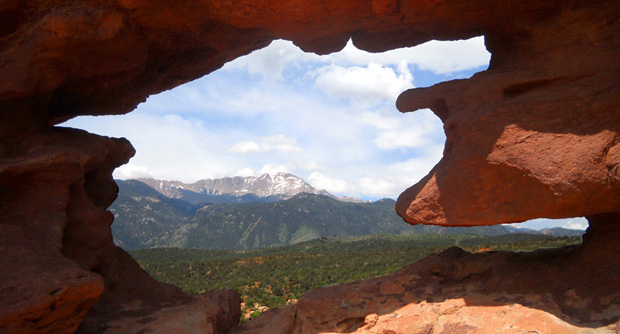 One woman returning to Twin Lakes was reported by several other runners to be �unconscious on the trail� between Lake Creek and the aid station so S&R went out to rescue her. They brought her back on a Stoke�s Basket with a wheel (to push her through the marsh and fields) and attended to her in our station for a couple of hours. 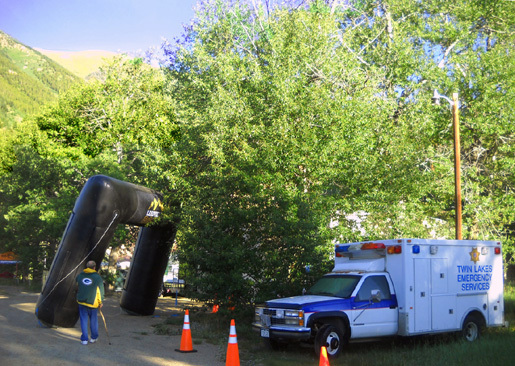 There were other �patients� in our aid station, too, but none had to leave in an ambulance this year. 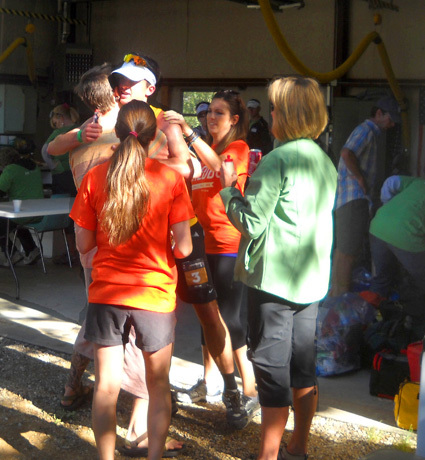 A runner gets hugs from his crew. We also heard about the first runner to finish and about the traffic nightmare on Winfield Rd. Getting to the Winfield AS has always been a problem, partly because of the bumpy dirt road surface for about ten miles but mostly because vehicles are allowed to drive all the way back to the aid station, including the two+ miles the runners use outbound and inbound. This time it was so jammed that crews couldn't move in and out. Volunteers were too busy at the aid station to do traffic control, too. Bill Moyer went out to get things under control. 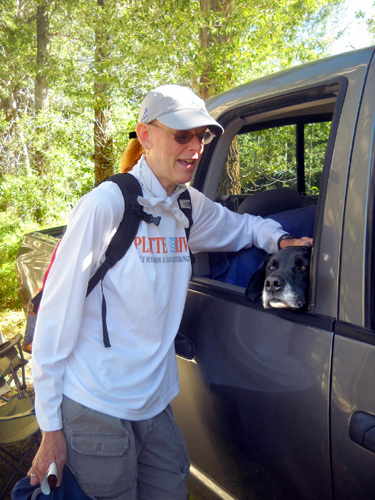 For two hours he refused to allow vehicles to go past the trailhead when runners came down from Hope Pass. 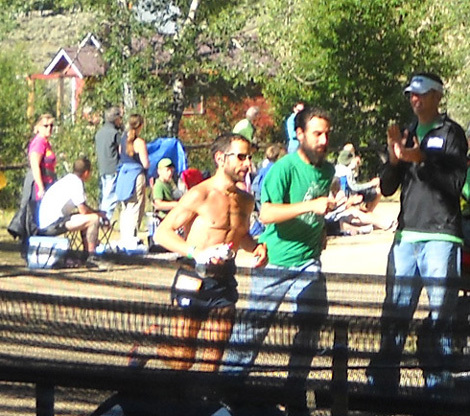 He let those crews meet their runners there; normally they can't crew at the trailhead. I'm glad I don't have to deal with that mess as either a runner or crew person any more. As a runner I hated the vehicle traffic on the road. 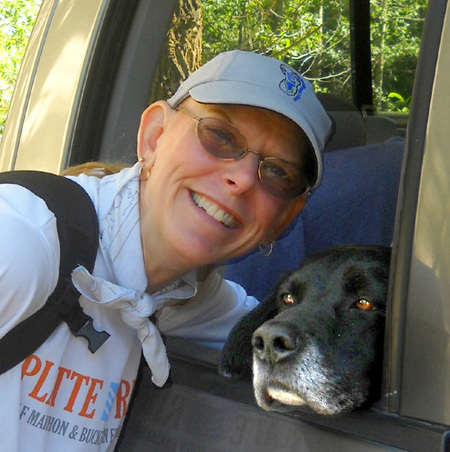 As a crew member, I hated the road, period, and I didn't like bothering the runners. That's just one of the downsides of allowing this race to get so big. 585 RUNNERS AND COUNTING . . . Despite being only fifteen feet from where runners either entered or exited the aid station we missed seeing most of the people we know both outbound, when it was busier, and inbound when it wasn�t. I was often reading the list of numbers and times to Jim and looking away from the entrance/exit, or going inside to get the numbers. We did have some time to talk with some folks, including our good friend Anne Watts when she came over to the truck periodically while waiting for Matt to come in at 40 and 60 miles. 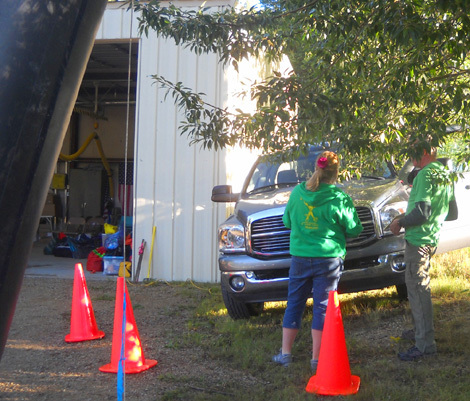 We were amazed that 95% of the runners that began the race made it through our aid station at 40 miles � about 585 of 611 starters. And that was with a new, stricter time cutoff (2 PM instead of 2:30 PM = 10 hours into the race). After that, however, there were a a lot of drops. Many runners either didn�t make it up to the Hope Pass aid station AKA "Hopeless" at 45 miles before the 4:30 PM cut-off outbound or they got there late and were redirected back down to Twin Lakes to drop at our station. If they don't make that cut-off there�s no point in continuing on to Winfield because there wouldn�t be anyone to take them back to town. �Hopeless� is about half a mile below the pass on the Twin Lakes side, another good reason to send them back to us instead of the more difficult trail to Winfield. Many runners also miss the cut-off at Winfield (50 miles) and are pulled from the race there. That's happened to me three times and to Jim several times, too. Runners who DNF at Winfield catch rides with their crew, other runners' crews, or the volunteers after the aid station closes. 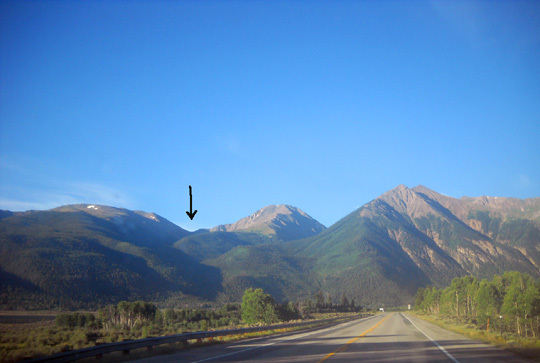 Runners who make the Winfield cut-off, even barely, are allowed to reverse course and head back up to Hope Pass. I doubt if any extra time was given at Winfield this year. The weather was too good. I've seen the cut-off extended at the last minute before when the weather was really nasty over Mount Hope. That doesn't mean those runners will make it back to Twin Lakes or later aid stations in time, however. There is no cut-off at Hope Pass 2 on the return at 55 miles. The only choice runners have at that point is to keep going down five more miles to Twin Lakes, either after dark Saturday night or in the morning on Sunday (some folks are kept up there overnight for medical reasons). If they miss the cut-off at Twin Lakes 2, they're out of the race. An early outbound runner comes into Twin Lakes AS Saturday morning. It seemed like we had more drops at Twin Lakes 2 -- inbound at 60 miles -- this time than last year, even with the cut-off extended 15+ minutes. We knew we were in for a long night when we heard on the radio that the last runner out of the aid station near Hope Pass 2 at 55 miles left there at 9:48 PM. That was after our announced cut-off time of 9:45 PM at Twin Lakes, and the last runners still had five miles of trail and a wide, fast creek to cross before reaching us. Sandy Monahan, the "Cut-Off Queen," allowed runners to continue from Twin Lakes until a little after 10 PM. I'm pretty sure I can guess the reason. About twenty runners came in between 9:45 and 10 PM and were allowed to continue. One of them was the CEO of Lifetime Fitness. I wonder how many of them finished?? That didn't mean Jim and I could leave. Although volunteers packed up most of the aid station supplies after 10, the last runners didn't arrive at our aid station at 12:16 AM Sunday. Even that didn't mean we could leave yet. We had to wait until it was certain no runners were between Winfield and Twin Lakes or Twin Lakes and the next inbound station, Half Pipe. The sweeps from Winfield (50 miles) didn�t get up to the Hope Pass aid station until about 11 PM. They reportedly left to come down five miles to Twin Lakes at 11:24 PM. It was very discouraging to us at Twin Lakes when we found out they were so late, because the AS captains (Heather and George), communications team (Jim and me), and a couple medical folks (one was a doctor) had to stay until the sweeps arrived both at our AS and the next one. It was a long wait. We weren't able to leave until almost 2 AM. Although it was very clear last night and the stars were spectacular out at Twin Lakes it was getting cloudy by the time we left early this morning to come back to the camper. 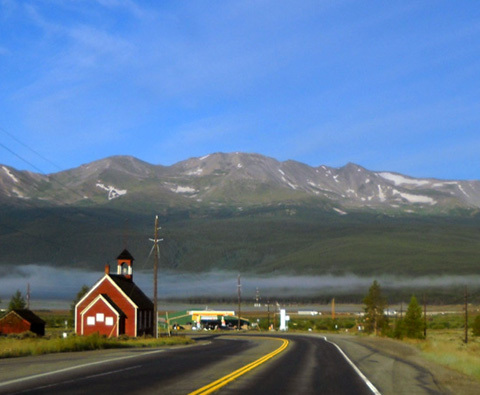 The clouds must have kept some heat in because it was in the low 60s when Jim got up at 8 AM; that's pretty warm for Leadville, even in the summer. I think all the runners got back to town before it started raining hard. Today would not have been a good day to be running in the mountains. I slept longer and felt tired all day today. Like with the bike race . . . I�m getting too old for this! We spent more time volunteering/driving yesterday (19� hours) than some of the runners spent running 100 miles!!! This time we didn�t go out to watch the runners at 6th and McWethy like we have most previous years. That corner is very close to our camper and 6/10ths of a mile from the finish line. Sometimes we cheer the runners in the last one or two hours before the final cut-off but we weren't in the mood for it this time. Neither did we go to the awards ceremony at noon. Jim discovered later in the afternoon that there was a Mexican dinner at the courtyard post-race for runners and volunteers. We probably would have gone if we�d known that. The food was pretty good after the bike race, and free to volunteers and race participants. �Live� results aren�t what they could be at this race. With the program they used there was no way to get an overall list of how people placed as the race proceeded. Most runners/crews/spectators at the race and folks at home are used to seeing that nowadays. You can find overall results for the race at this link. Or go to the main page of the race series and click on "results" for age groups, etc. Four runners� times were listed over 30 hours. The last one is the CEO of Lifetime Fitness. It didn't seem to help that he was allowed extra time at Twin Lakes. We haven�t seen times listed previously for folks who finish over 30 hours. But hey, it's his race now and he can do anything he wants! Now, if they�d just add a couple hours to this race . . .
We are glad to see that some of our friends are on the finishers' list, including Matt Watts, Liz Bauer, Scott Brockmeier, Larry Hall, Tim Long, Rhonda Sundermeier, Kirk Apt, and David Snipes. We are surprised by some of the DNFs. You can find them by putting in a runner�s name or number individually. Unfortunately, Bill Heldenbrand, Tammy Massey, Karsten Solheim, and probably a few others DNF�d and are out of the Grand Slam. We can feel their pain; Jim's one and only Grand Slam attempt was foiled in 2004. Joe Judd, Marge Hickman, Marcia Rasmussen, Dan Brenden, Matt Mahoney, and some other people we know are not listed among the finishers either. Some of them have finished LT100 before. All will probably return and try again another year. Jim had a better time this year than last working the radio at Twin Lakes. He really liked not having to call in all the numbers this time. That gets too tedious with so many runners, and last year one of the hams at net control kept asking him to repeat his numbers (none of the other hams did). He also liked not working at net control this time. That's been more fun at Hardrock than Leadville. I let myself get too frustrated (again) with crews who wanted to grow roots near the entrance/exit of the aid station. I guess I need to learn to be more patient with people. I probably would have had more fun if I'd lightened up and just let them trample the timing cords and block the way between the AS and our truck . . .
at the arrow and the road is lined with crew cars for 1/2 mile in either direction. The aid station is a quarter mile from here, toward the left. The main drawback to working Twin Lakes communications is having to be out there so long. It would have been a much more pleasant experience if someone had relieved us after eight or nine hours. I don�t know if we�ll do it again. I�m not as adamant about never doing this again as I am about never working the aid station at Twin Lakes (different location) for the bike race . . . but even the foot race has gotten too big to be much fun for anyone � runners, crews, or volunteers. 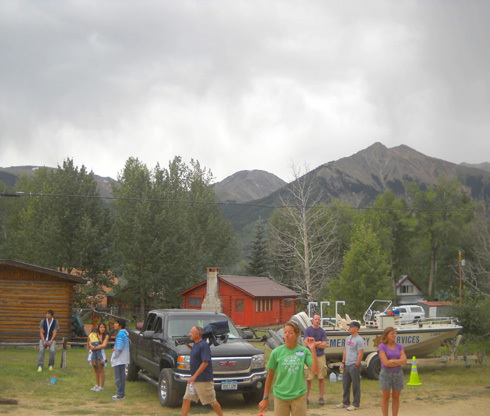 Problem is, we like hanging out in Leadville in August, and if we�re here, it�s hard NOT to work the races! If we go to Alaska all next summer we won�t have this dilemma. (That�s not the reason we want to go there, of course.) 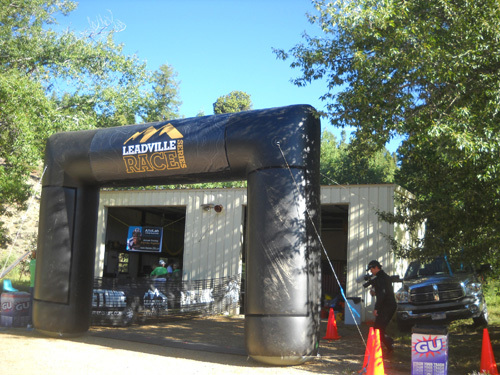 In two years, maybe selective memory will kick in again and we�ll have forgotten all the stuff about the Leadville races that drives us crazy and be eager to help again. Right now, not so much.